I have one cup of coffee per day, the first thing in the morning. Five days a week I go to work and make a fresh pot upon arrival. On the weekends I have a huge cup of really good coffee that lasts me all morning. Recently I was sort of craving a little somethin’ somethin’ to go with the coffee. Shut up, you, not that somethin’ somethin’. I’m talking about something sweet, but not something intense that knocks your socks off, like my Plum Kuchen. No chocolate. No lemon. No, just a little cookie that is calm and not too sweet, to nibble along with my coffee. Maybe even two of them. A serious indulgence here. Ha. Anyway, these Pecan Sandies are perfect with my coffee and I have enjoyed them very much. They are dredged in sugar after they’re cooled, but truthfully, not very much sticks. It’s minor. Really. And the ground pecans give them just the right flavor to complement my creamy sweet coffee. So, if you are looking for a little somethin’ somethin’ sweet to go with your hot beverage, give these Sandies a try. You’ll be happy you did. 2. 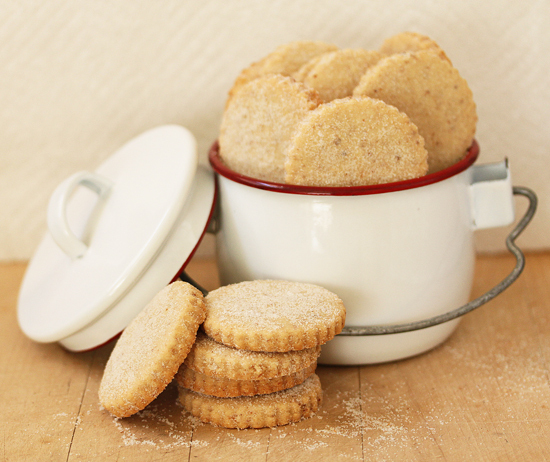 In a large bowl, mix the butter, sugar and salt with a fork until thoroughly combined. Beat 50 more strokes until light and fluffy. 3. Beat in the egg and vanilla until smooth. Beat in the pecans. 4. Add the flour 1/3 at a time, combining each completely. 5. On a floured work surface or pastry cloth, divide the dough into 3 pieces. Roll out one piece to about 3/8-inch thick. Cut dough with fluted cutter and place on prepared sheet about one inch apart. 6. Save dough scraps until the end, reroll and cut more cookies. 7. Bake cookies about 20 to 25 minutes, until light golden brown on bottom and very pale on top. 8. Cool cookies on parchment or foil on rack. When cool, roll in granulated sugar. 9. Store between sheets of parchment paper in airtight container at room temperature. 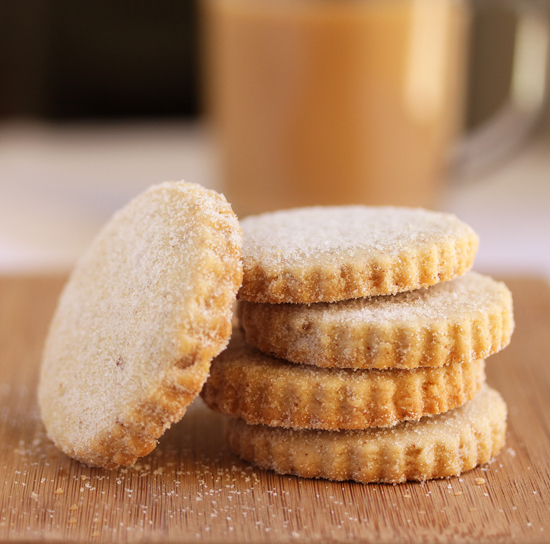 My dad used to have his own stash of cookies and crackers just for him (us kids had other stuff), and I used to sneak in the cupboard and steal his Pecan Sandies. These look better than the original! Hello! I just made these to give as Christmas gifts, and they are just so lovely! Nice and buttery, but light and crunchy. Thanks so much! 20 minutes was too long for me. And I had two thermometers checking (and agreeing) on oven temp at 325. The ones I baked for 16 minutes were wonderful however. I made half a recipe and used just the yolk as I saw that in other recipes. I was looking for a good pecan shortbread cookie recipe to make this Christmas. I came across your recipe as it was closest to what I was looking for. The batch of cookies I made turned out perfectly. Good cookie crunch with the right amount of sugar. This recipe is a keeper. Thanks for sharing.